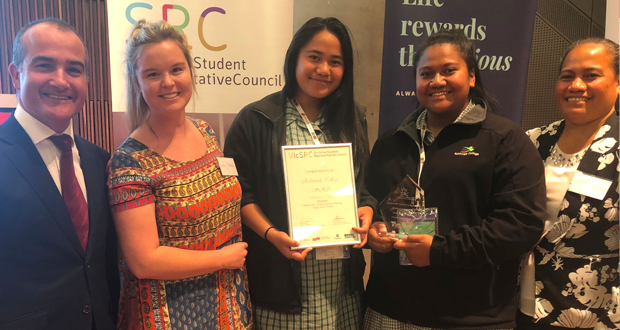 The incredible work of the Robinvale College Student Representative Council (SRC) was recognised last Thursday night when they took out the top prize for the VicSRC Student Voice Group Action Award. Celebrating best practice in student voice, leadership and student-led action in Victoria, the Robinvale SRC won the award for their commitment and focus on reducing instances of bullying. Council’s Youth Support Officer Nellie Patterson said she was extremely proud of what the students had achieved in such a short time. “The Robinvale SRC actually underwent a complete restructure last year, so they’re a relatively new group,” Ms Patterson said. Ms Patterson added that it was this new found direction that prompted the students to reach out to VicSRC. “VicSRC helped them work alongside their teachers to conduct a survey of all students so they could get a better understanding of any areas of concern. “When it was identified that bullying was the top issue, they researched and prepared a presentation, addressed teachers at a staff meeting and split into small student-teacher groups to brainstorm some tangible and realistic solutions. “And following the workshop they implemented a number of changes at the College, including the creation of their ‘Just Say No’ anti-bullying project, which resulted in a real cultural shift in their school environment.